Registration Link https://goo.gl/iP4u1s. From 7th Dec. to 31st Dec. 2018. Employers from all over Ahmedabad District can participate in the following Job fair. To participate please fill all the details below and submit the form. After getting your basic details we will send an email with an excel sheet to collect specific details about your vacancies. 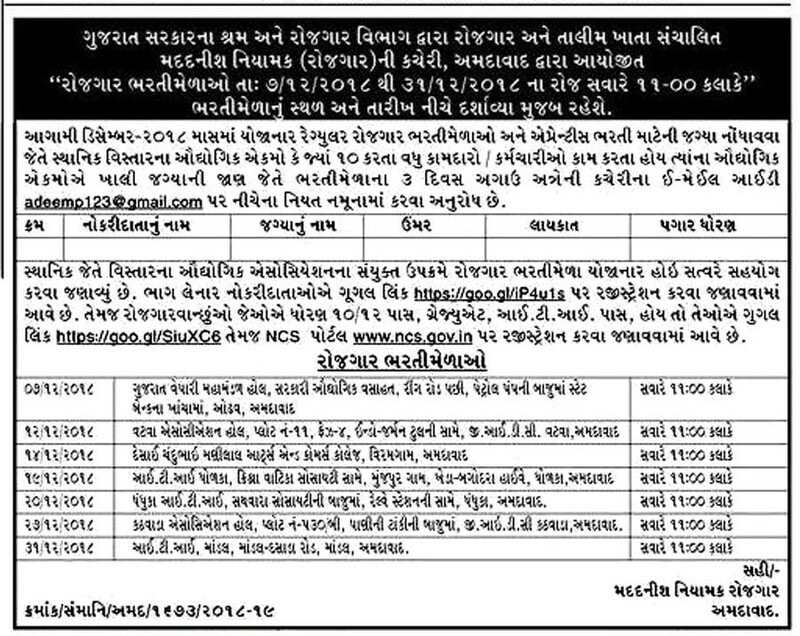 District Employment Exchange Office, Ahmedabad Latest Job Fair Official Notification as Rojgar Bharti Mela. Eligible candidates can apply for this Rozgaar Bharti Mela (December 2018) Various Date & Center Organization by DEE Office Ahmedabad. You can view more details about this recruitment including No. of posts, Company Name, Education Details, Age Limit, How to Apply etc all details are given below. Employment and training center stated in ahmedabad district published advertisement of the rojgar bharti mela. Here is the detailed advertisement which was published in news paper. This bharti melo contains the post of apprenticeship in amdavad and arranged by rojgar and talim khatu. The place for this rojgar bharti melo is FD Education campus, nr. rahenuma society, APMC Market ni same, vishala circle ni baju mma, sarkhej road, Ahmedabad. Qualification: 8th Paas, SSC Paas, ITI Paas, Diploma / Graduate. Education qualification is different for each post so that Please refer Official Notification for Educational Qualification details. The official notification of this amdavad official notification is in gujarati language. FD Education campus, nr. rahenuma society, APMC Market ni same, vishala circle ni baju mma, sarkhej road, Ahmedabad. MY NAME IS JAYDEEP CHAUHAN. MY 6 YEARS SALES PRAMOTAR RELINCE MARKET C&C IN AHMEDAD AND MY COMPALETED COURAS 1 YEARS ITI (P.P.O) COURS & 3 MONTH COMPUTAR SKILL,SOFT SKILLS. I have completed B.A with Economic.